I didn’t quite get the stripes to match up properly – but it doesn’t make them any less cosy! Photo shows where the yoke ends, and you divide for the armholes. But because I’ve such straight shoulders, I’ve knitted 6 extra rows before dividing it. I also wanted to keep the neck higher as above – I’ve noticed in some versions that it opens out into a wider neckline on some people, so I’m hoping that less stretching into the armhole will mean the neck doesn’t open out too much. I definitely caught the sock-making bug after following along with Two socks, one week. 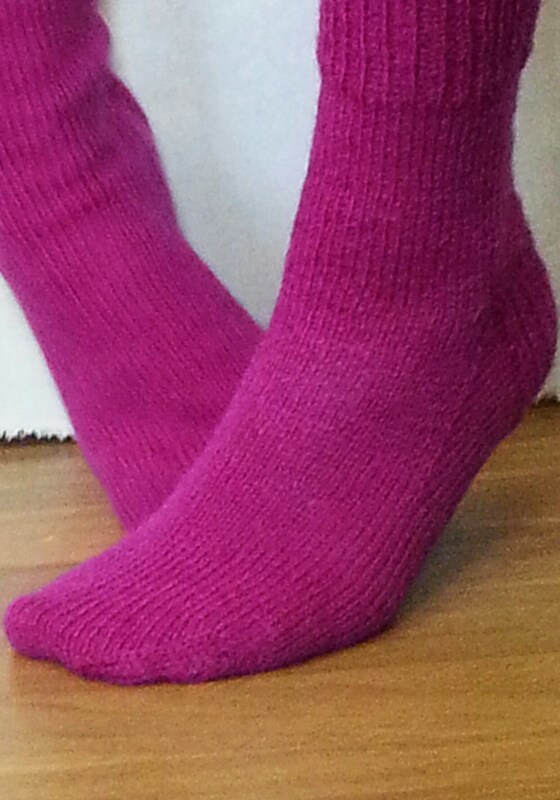 After my first pair were done I bought some Rico Superba bamboo yarn to make a second pair. I made a few little changes this time round – I knitted the cuff in K1 P2 rib and I also used less stitches on the circumference (56 total sts after the decrease row. 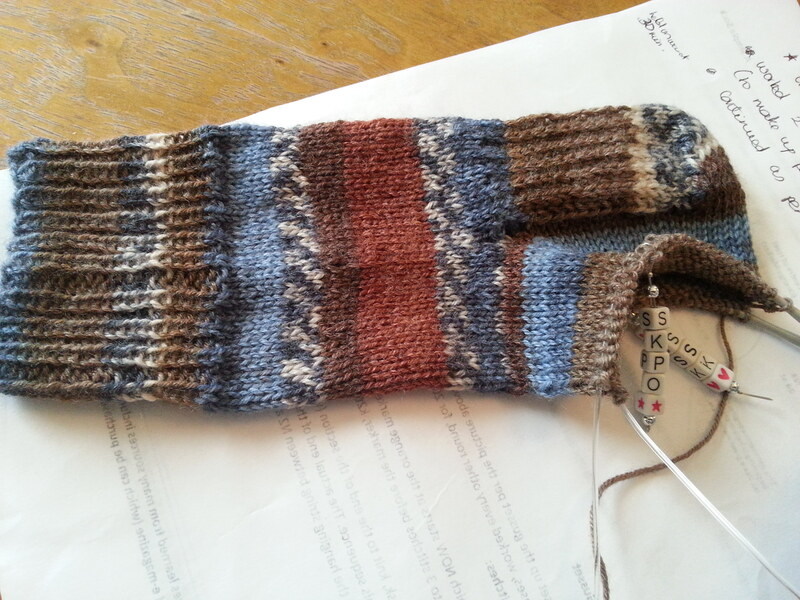 I’m not to keen on the striping yarn – I think I’d prefer a darker colour. But the interesting thing is what started as just being curious about how socks were made, has now become a real understanding for why people knit socks! On my first sock I really thought it was too much work for something that could be purchased easily and cheaply. The main reason I sew, is that it costs a lot less to make the things I want to wear. But with sock knitting, it seems to be more about making something manageable when the urge to knit comes on. I hate watching tv without something to occupy my hands , or even waiting in the car – I often wish I had my knitting along. Socks seem to be the perfect project to have on the go between other projects. I came across the Socks with sarah KAL and thought it was such a good idea. I’m hoping to keep sock-making as a regular part of my knitting. I don’t think it’ll happen every day, but definitely every week. I am looking at some new patterns to try out – and there are a few techniques I’d like to try too – like added a thicker padded sole. Maybe in a different yarn or a different stitch ( need to research a few so any suggestions are welcome). The good thing about the knitalong is watching what everyone else is making and getting inspired! 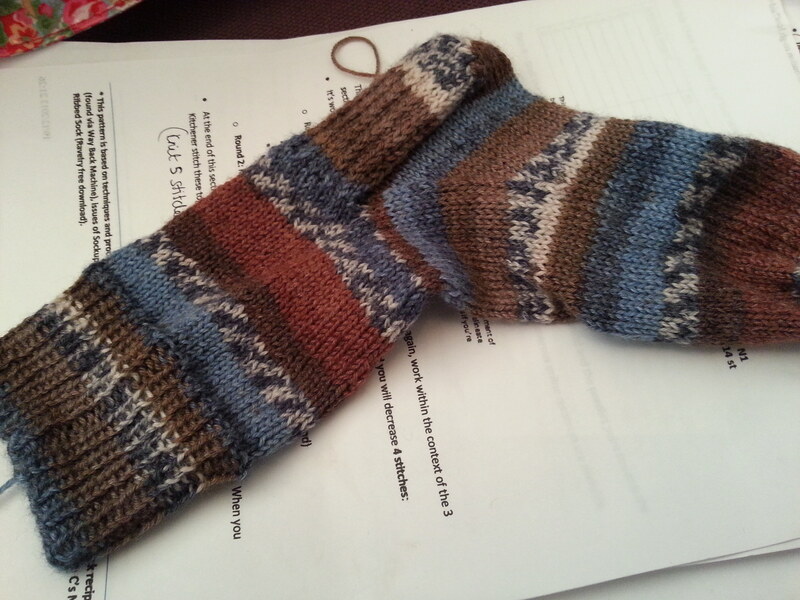 Finished – my first pair of socks ! I’m so glad I tried something new. During knitting the first sock, I really though it was too much work for ‘just socks’ , but I’m a convert to sock knitting. The second sock just came together without me even noticing. We were watching a lot of movies over the holiday evenings, and I just knit away. I did have a few bumps with the first sock but it was so handy to have all the help and videos from Kristin and I was determined to learn some new techniques. Long tail cast on, magic loop and kitchener stitch were all new to me. I’ve already cast on a second pair – although I don’t think they”l be ready in a week! But I do think it’ll be handy to have a pair of socks on the go, to pick up at TV time or in between.